Today's post is more of a note-to-self than anything else. I'm always trying to remember how the various browsers identify themselves to servers. The attendant user-agent strings are impossible to carry around in one's head, so I'm setting them down here for future reference. Interestingly, Acrobat seems to spoof a Safari signature. If you want to perform this test yourself right now, using your present browser, simply aim your browser at http://whatsmyuseragent.com/, and you'll get a complete report on the full header sent by your browser to the server. This post has moved to: http://asserttrue.blogspot.com/2010/08/common-user-agent-strings_25.html. Please forgive the inconvenience. At a 30,000 foot level, we had similar approaches to running a company. But at a working level, there were some very definite philosophical differences. There was a definite difference in the customer orientation. We spent a lot more time talking to customers. Adobe's philosophy was more of an engineering-based one: if we make a great product, like PostScript, sooner or later people will want it. But the reason I even considered Adobe was their underlying ethical standard of running a high-quality company that was fair to their customers and their employees. Unfortunately, that couldn't be said of all the companies in the industry. A lot of thought went into the merger, and I think it was one of the best. Hopefully, we'll all be saying much the same thing about the Day-Adobe deal years from now. Modularizing components and allowing for their reuse. Enabling various WCM content management tools such as CQ's Sidekick, which help web authors to create and edit web pages. Creating a Designer to provide a consistent look and feel to a website, and using a common CSS file. Creating a navigation component that to provide dynamic navigation to all pages as they are added or removed by authors. Adding log messages to .jsp scripts, and using the CRXDE debugger. Creating components to display a customizable page title, logo, breadcrumbs, and configurable paragraph. Creating and adding a complex component (containing text and images), to implement bespoke functionality. Internationalization, so that dialogs displayed to web authors can be displayed in one of the 7 languages supported out-of-the-box by Day Communiqué. By the end of the third day, we had written hundreds of lines of JSP and manually created scores upon scores of custom nodes and properties in the repository. Still to come: Creating and consuming custom OSGi bundles; workflow; and performance optimization tools. Yesterday, I made it through Day One of developer training at Day Software's Boston office. It was an interesting experience. We spent much of the morning talking about architecture, standards, and the Day technology stack, which is built on OSGi, JCR (JSR-283), Apache Jackrabbit, and Apache Sling. Surprisingly (to me), OSGi was an unfamiliar topic to a number of people. The fact that bundles could be started and stopped without taking the server down was, for example, a new concept for some. All of us were given USB memory sticks containing the Day Communiqué distribution (and a training license), and we were asked to install the product locally from the flash drive. A couple of people had trouble getting the product to launch (they received the dreaded "Server not ready, browser not launched" message). In one case, it was a firewall issue that was easily resolved. In another case, someone was using Java 1.3 (the product requires 1.5, minimum). A third person had trouble getting WebDAV to work on Windows 7. I noticed, in general, that the people with the fewest problems (all the way through the class) were using Macs. We were shown how to access the CQ Servlet Engine administration console, the CRX launchpad UI and Content Explorer, and the Apache Felix (OSGi) console, as well as the CRXDE Lite integrated development environment -- a very nice browser-based IDE for doing repository administration and JSP development, among other tasks. We were also shown how to (and in fact we did) set up author and publish instances of CQ on our local drives, and replicate content back and forth between them. Some students had trouble getting used to the fact that in JCR, everything is either a node or a property. "Folders" in the repository, for example, are actually nodes of type nt:folder. If you use WebDAV to drag and drop a file into a folder, the file becomes a node of type nt:file and the content of the file is now under a jcr:content node with a jcr:data property holding the actual content. It requires a new way of thinking. But once you get the hang of it, it's not hard at all. Day Two promises to be interesting as we take a closer look at Sling, URL decomposition and script resolution, and component hierarchies. Hopefully, we'll get even more JSP under our fingernails! (and will return 404 if no such node exists). If the node is found, Sling then looks for a special property on that node named "sling:resourceType," which (if present) determines the resource type for that node. Sling will look under /apps (then /lib) to find a script that applies to the resource type. Let's consider a very simple example. Suppose that the resource type for the above node is "hr/job." In that case, Sling will look for a script called /apps/hr/job/job.jsp or /apps/hr/job/job.esp. (The .esp extension is for ECMAScript server pages.) However, if such a script doesn't exist, Sling will then look for /apps/hr/job/GET.jsp (or .esp) to service the GET request. Sling will also count apps/hr/job/html.jsp (or .esp) as a match, if it finds it. In this case, .detail is a selector. Sling will look for a script at /apps/hr/job/job.detail.esp. But /apps/hr/job/job.detail.html.esp will also work. In this case, there are two selectors (.print and .a4) as well as a file extension (html). How does Sling know where to start looking for a matching script? Well, it turns out that if a file called a4.html.jsp exists under a path of /apps/hr/jobs/print/, it will be chosen before any other scripts that might match. If such a file doesn't exist but there happens to be a file, html.jsp, under /apps/hr/jobs/print/a4/, that file would be chosen next. This precedence order is somewhat at odds with the example given in SLING-387. In particular, a script named print.a4.GET.html.jsp never gets chosen (nor does print.a4.html.jsp). Whether this is by design or constitutes a bug has yet to be determined. But in any case, the above precedence behavior has been verified. The w3c-dist-auth@w3.org list today received an interesting proposal for a new protocol, tentatively dubbed JSOP by its authors (David Nüscheler and Julian Reschke of Day Software). As the name hints, JSOP would be based on JSON and would be a RESTful protocol designed to facilitate the exchange of fine-grained information between browsers and (repository-based) server apps. As such, it's one of the first proposals (maybe the first?) to make extensive use of HTTP's new PATCH verb. Why does the world need JSOP? "For the past number of years I always found myself in the situations where I wanted to exchange fine-grained information between a typical current browser and a server that persists the information," explains David Nüscheler. "In most cases for me the server obviously was a Content Repository, but I think the problem set is more general and applies to any web application that manages and displays data or information. It seemed that every developer would come up with an ad-hoc solution to that very same problem of reading or writing fine-grained data at a more granular level than a resource." In the above example (with nested folders), notice that the GET is on a URL of /myfolder.4.json. Notice the '.4.json', indicating that the server should return folders 4 levels deep. where + means to create a node/property/resource, - means delete, > means move, and ^ means update. Add it all up and what do you get? Nothing less than the dial tone of the 21st century, I'd say. The original image ("Lena"), left, and the same image transformed via Smart Sobel (right). Ordinary Sobel transformation produces a rather harsh result. This is an effect whose harshness begs to be tamed by the "smart" approach. 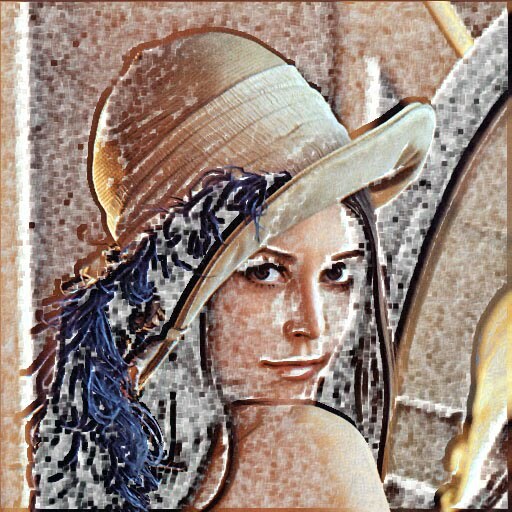 With a "smart Sobel" filter, we would apply maximum Sobel effect to the least-noisy parts of the image and no Sobel filtering to the "busiest" parts of the image, and interpolate between the two extremes for other parts of the image. To use the filter, instantiate it and then call the filter() method, passing a java.awt.image.BufferedImage. The method returns a transformed BufferedImage. There are two knobs to tweak: SENSITIVITY and REGION_SIZE. The former affects how much interpolation happens between native pixels and transformed pixels; a larger value means a more extreme Sobel effect. The latter is the size of the "neighboring region" that will be analyzed for noisiness as we step through the image pixel by pixel. This parameter affects how "blocky" the final image looks. Overlay (combine) the same image with copies of itself, transformed with various values for SENSITIVITY and REGION_SIZE, to reduce "blockiness"
Original image. Click to enlarge. 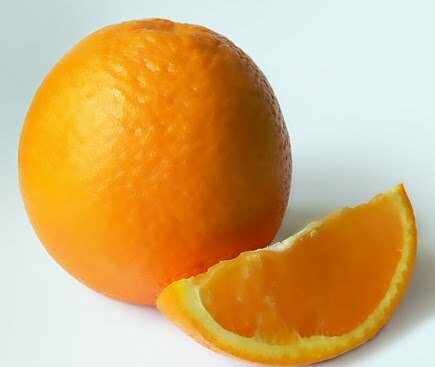 preserved, even where the oranges overlap. One of my favorite Photoshop effects is Smart Blur, which provides a seemingly effortless way to smooth out JPEG artifacts, remove blemishes from skin in photographs of people, etc. Its utility lies in the fact that despite the considerable blurriness it imparts to many regions of an image, it preserves outlines and fine details (the more important parts of an image, usually). Thus it gives the effect of magically blurring only those parts of the image that you want to be blurred. The key to how Smart Blur works is that it preferentially blurs parts of an image that are sparse in detail (rich in low-frequency information) while leaving untouched the parts of the image that are comparatively rich in detail (rich in high-frequency information). Abrupt transitions in tone are ignored; areas of subtle change are smoothed (and thus made even more subtle). 1. March through the image pixel by pixel. 2. For each pixel, analyze an adjacent region (say, the adjoining 5 pixel by 5 pixel square). 3. Calculate some metric of pixel variance for that region. 4. Compare the variance to some predetermined threshold value. 5. If the variance exceeds the threshold, do nothing. 6. If the variance is less than the threshold, apply blurring to the source pixel. But vary the amount of blurring according to the variance: low variance, more blurring (high variance, less blurring). In the implementation presented below, I start by cloning the current image and massively blurring the entire (cloned) image. Then I march through the pixels of the original image and begin doing the region-by-region analysis. When I need to apply blurring, I derive the new pixel by linear interpolation between original and cloned-image pixels. So the first thing we need is a routine for linear interpolation between two values; and a corresponding routine for linear interpolation between two pixel values. // This inner class is our canvas. // We draw the image on it. Despite all the intensive image analysis, the routine is fairly fast: On my machine, it takes about one second to process a 640x480 image. That's slower than Photoshop by a factor of five, or more, but still not bad (given that it's "only Java"). Substitute a directional blur for the non-directional blur. Substitute a Sobel kernel for the blur kernel. Try other sorts of kernels as well. The source image ("Lena") at left. According to Wikipedia, "An image histogram is a type of histogram which acts as a graphical representation of the tonal distribution in a digital image. 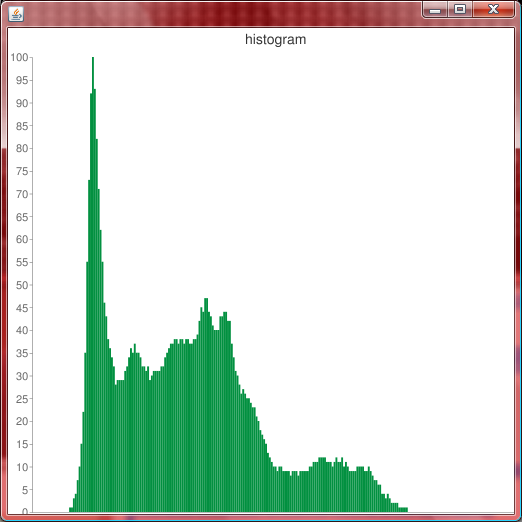 It plots the number of pixels for each tonal value. By looking at the histogram for a specific image a viewer will be able to judge the entire tonal distribution at a glance." Note that we actually tally only the green pixel values. (But these are the most representative of tonal values in an RGB image, generally.) Table values are normalized against maxValue, then multiplied by 100 to result in a number in the range 0..100. Google obligingly plots the data exactly as shown in the above graphic.